What's planted at Prescott Park? This summer the new south entry will be built to provide new bike racks, benches, plantings, and an elegant entryway into Prescott Park. The benches will be designed to harmonize with the historic front entry (west) of the school. See the design concept sketch by Eileen Bergt from way back in 2010 and the final plans below. It should be another wonderful addition for the Prescott Community! The 2015 Prescott Walkathon featured the unveiling of the Outdoor Classroom fossil dig. The area was constructed by Chad Johnson and features rock benches, a walled seating area, and sand dig pit. Funding for the fossil dig was raised by the school kids through their Walkathon. Lurking at the bottom of the pit kids can uncover Smilodon Fatalis, a built-to-scale sabertooth cat skeleton from the Pleistocene Era. A big thank you to everyone who came and participated in our 6th annual Summer Festival! 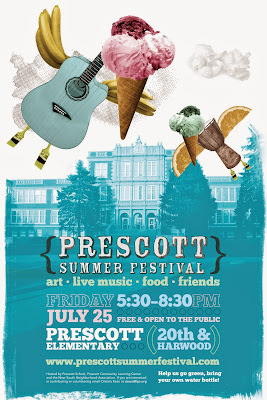 Prescott's Summer Festival is about a month away. Mark your calendars for July 25th at 5:30pm. There will be lots of fun, food, and animals! This year's 5th annual Walkathon was a great success! Students raised over $10,000 to contribute towards our Outdoor Classroom. Throughout the day students, guests, and teachers walked a combined total of 1,065 miles!! We had an abundance of volunteers come to help out throughout the day: Lincoln Police Department, Lincoln Fire & Rescue, No Coast Derby Girls, the US Army, the Saltdogs, Lincoln Parks & Rec, Texas Roadhouse, Lincoln Children's Zoo, and KOLN/KGIN TV. For second quarter clubs Aidan Carlson, Ellery DeVries, Evan Schomer, Lydia Skold, and Ivy Stanton constructed a Prescott Park Newsletter, talking about Prescott's Outdoor Classroom. Go ahead and take a look at the work they've done at the website below! The community is invited to join in a celebration of historic Prescott School on Sunday, November 17, 2013 at 4:00pm. Everyone interested and connected with the school are invited to hear a presentation by Ed Zimmer about the history of Prescott, as well as take tours and listen to remembrances by our alums. There will also be a free pizza dinner. Please join the many friends of Prescott and share your memories of historic Prescott School. on the First Day of School! The 5th Annual Summer Festival was on Friday, July 26th. There was live music, animals, arts and crafts, dancing, food trucks, and so much more.Click on the Summer Festival 2013 link in the sidebar to see photos of the event. Prescott Elementary is an active, healthy school. We were recently featured on "Bright Spots". Click on the link below to learn all about our school's wellness focus. Thanks to all the volunteers who made this day so great! Prescott 5th graders have recently launched the Prescott Park Newsletter! Monthly newsletters will be available by clicking on "Prescott Park Newsletter" in the sidebar! Here is how far we've come. A slide show of the whole building process is in our Playground Updates. The Gazebo is now done! A school and neighborhood were joined by a summer heat wave Friday evening for a festival at Prescott Elementary School, 1930 S. 20th St. The festival was designed to show off the new park area, and serve as a reminder for the neighborhood that they can enjoy the walking trail and open space. Music, balloons and face painting were joined by hula hoops, local organizations with different activities, and food and water. See our photo gallery for highlights. TV Channel 10/11's Lance's Journal did a story on the Walkathon! Prescott Park and Walkathon was featured in the Lincoln Journal Star. Prescott plans Walkathon to raise money to turn playground into community park. "The second annual walkathon to raise money for the next phase of the project is set for May 11. LPS Superintendent Steve Joel will cut a ceremonial ribbon and take a lap around the walking path with the kindergartners. Community leaders will be walking coaches for the different grades." Prescott Elementary School will be holding the second annual community Walkathon on Wednesday, May 11, 2011 between 8:30am and 3:30pm. Last year was a great success! Prescott students, staff, parents and neighborhood members walked throughout the day and combined to covered over 1,400 miles. Everyone had a great time, but most importantly, the neighborhood and school raised enough money to pay for grass to be planted on the playground and a walking path to be installed. With the spring weather on the horizon, the grass is coming in and the concrete path will be poured as soon as the weather allows. This year our fundraising will lead us into the second phase of the Prescott Park Plan. Funds raised will go toward our outdoor classroom, performance stage, and plantings to beautify the park and neighborhood. With the help of parents, friends, neighbors and community businesses, we hope to raise $10,000 for Prescott Park. This is a great opportunity to support a project to bring a new park space to a part of the neighborhood without places to play, walk, and gather. Students and families will be talking to friends and maybe knocking on your door to sign up donors who will donate a dollar amount in exchange for completing the walk. rescott students, parents, and community members will be walking in shifts all day. Each class will be scheduled a time slot of 30-60 minutes. Each class will be matched up with a celebrity coach and mascot to help them stretch and join them on the walk. Each class will have a community sponsor that will donate to the event. During the event, kids will eat lunch on the front lawn. We will have music, lead donor and sponsor recognition, and press coverage. 5/12/2011: Walkathon raises over $13,000 in a day! 9/28/2010: DIRT WAS PULVERIZED & GRASS SEED WAS ADDED! 9/7/2010: TREES HAVE BEEN TRIMMED FROM POWERLINES & DIRT HAS BEEN ADDED! 8/24/2010: GRAVEL REMOVED FROM PLAYGROUND! The Prescott playground area provides prime space for community gathering, nature exposure and extended educational opportunities. The Prescott Park & Outdoor Classroom addresses these opportunities with grassy fields, walking paths, a stage and outdoor learning materials. This design was donated by Dimension Foundation Nature Explore ClassroomTM . Please be sure to take a look at all aspects of the project using the menu on the left. To print off a brochure, please download the 2 files below.